We unlock opportunities for everyday people to get involved, deeply, in the work of their governments. We create enjoyable, interactive and meaningful processes that help motivate citizens to get involved and contribute to improving our democratic system. We design and run processes that seek to involve a diverse range of the community, not just those with a strong interest in the issue. 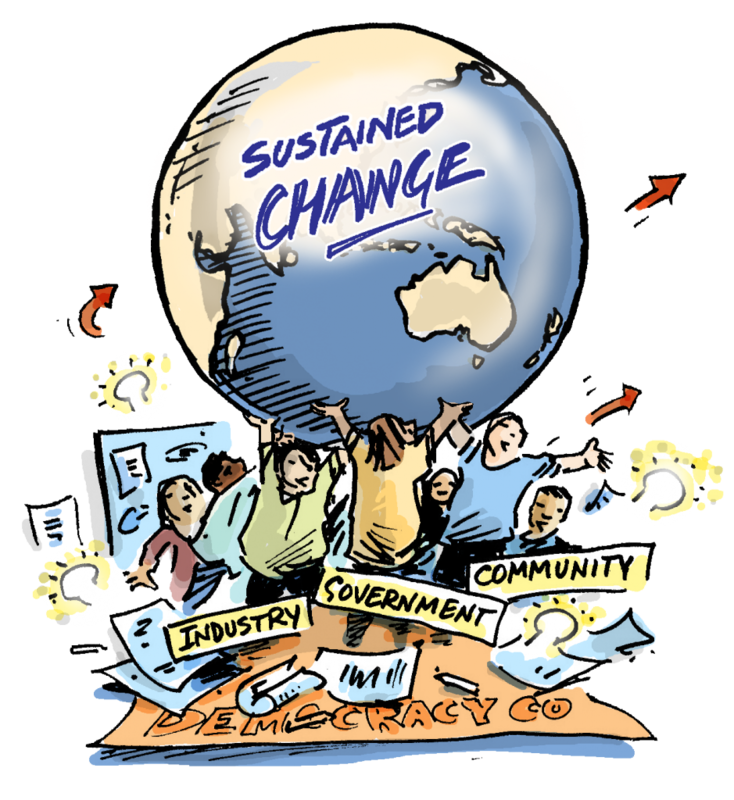 Democracies succeed where citizens take an interest, stay informed and get involved. Australia and many other western democracies are facing plummeting levels of trust in government. This is a significant challenge and risk for the future of democracies. Activating citizens and enabling them to contribute to their democracy is one way to build understanding of the democratic system and improve levels of trust. Quite often citizens are only offered the chance to participate in their democracy at elections and the experience is rarely inspiring or mobilising. Unlocking opportunities for more people to participate in the work of government is complex, challenging and exciting. We work with communities to find a way for them to come together, think, listen and create solutions that can, over time, change the dynamic for the better. At democracyCo we are committed to running processes that enable everyone who has an interest to contribute and also importantly to bringing people together, face to face. Our belief is that the virtual world provides a wonderful resource for supporting deliberation, however for people to ‘come on the journey with you’ they must see the emotion, the impacts and the consequences on other human beings. As is so evident on social media generally, our experience tells us that the online environment tends to polarise rather than build agreement and consensus. Deliberation is about finding ways to tap into shared or similar value sets to develop policy that the vast majority of people can accept and support. "I don’t think there’s much substitute to face to face when you’re talking about and grappling with value judgements. You have to be able to look people in the eye and say ‘I think this and this is why…‘with the opportunity to question, gain clarity and reflect. There’s something intensely personal about it. There’s separation online - you can’t address the emotional ethical consequences of a decision."